Here are some events we thought would be of interest to Groundswell members and followers this month. Just a couple of volunteer opportunities in February, but stay tuned for more as spring approaches! Happy New Year to all Groundswell NW friends, followers, volunteers and supporters! 2018 came to an end on a high note with one of our long-time fiscal sponsor groups, the East Ballard Community Association, receiving a Denny Award from Seattle Parks for the 14th Ave NW / Gemenskap Park project. You can help keep that momentum going by voting for 14th Ave NW, Seattle for a Streetsie Award by Streetsblog USA. The vote closes January 2, so act now. Happy Holidays Groundswell Friends and Neighbors! The East Ballard Community Association has been recognized by Seattle Parks with a Denny Award for their incredible work to complete the first phase of Gemenskap Park, an effort they began back in 2005. 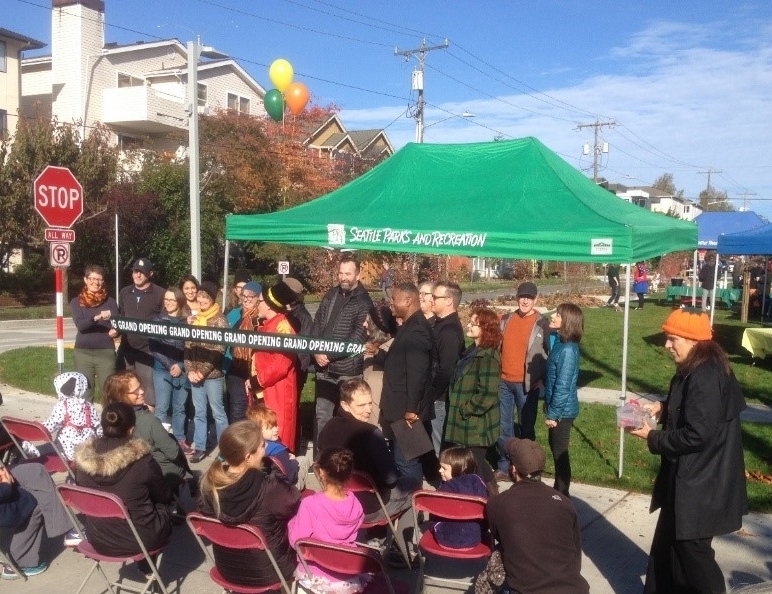 Congratulations to Groundswell NW Past President, Board Advisor and Local Hero Dawn Hemminger, Peter Locke and all the other EBCA stalwarts who had the vision and perseverance to see this complex project through to reality. Here's to seeing the vision of expanding these two blocks and connecting all the way from Ballard High to Salmon Bay! Beginning in 2019, we are also happy to welcome a new team member to the Groundswell organization—David Traylor. David will work with the Groundswell NW board as bookkeeper and administrative assistant. David is a landscape architect and artist who comes with experience helping other non-profits like Urban Sparks and Seattle Parks Foundation. Many thanks to Chris Hemminger for his past efforts as a volunteer bookkeeper. Do you live in NW Seattle and have a natural urge to explore? A good scavenger hunt in the neighborhood can satiate that urge while burning a few calories during the holiday season. Groundswell NW, in collaboration with Seattle Parks, recently completed the installation of a park bench in NW Seattle. Your mission, should you decide to accept it, is to find this bench by January 15, 2019. We will be offering clues throughout December and January on our Facebook Page and a randomly drawn winner will be announced January 16, 2019 to receive a $25 REI GIFT CARD. If you have found the bench, please post either a selfie or a photo of the lone bench to our Facebook page (do not reveal the location to others!) With your post, tell us if the bench location inspires you and if not, what would you like to see happen to make this space more engaging? Last Saturday, October 27th, the sun came out to bless the dedication of the first phase of Gemenskap Park. The Ballard High School band and project stalwart Peter Locke, lead a parade around the park with local neighbors and children in costume. The festivities continued with presentations by Peter, Interim Parks Superintendent Christopher Williams and former Groundswell President Dawn Hemminger. The latter two held the ends of the ribbon while Peter wielded the giant scissors. Warmest congratulations to Dawn Hemminger who stuck with this project from it’s inception over 10 years ago! Gemenskap Park fills a gap identified in Groundswell’s 1996 open space inventory and represents what we hope is the first “blossoming” of a seed planted in our 1997 North Salmon Bay Community Forest Plan, which called for greening 14th Ave NW. The East Ballard Community Association, with Dawn and Peter in the lead, took that idea and created a bold vision of park blocks all the way from Ballard High to Salmon Bay. Kudos on completing these first two blocks! The good vibe continued during the grand opening when Groundswell NW was presented with a check for $8,000 from the Fremont Neighborhood Fund, a small non-profit whose missions was making grants to improve the quality of life in our community. FNF has decided to dissolve and distribute its remaining assets to other similar non-profit groups. Susanne Daniell, Dave Boyd and Dawn Hemminger accepted the check on behalf of Groundswell, and we all thank FNF for their generosity! Do you want to be a part of our energetic community with a mission to grow green spaces in NW Seattle? Groundswell NW is looking for a part-time bookkeeper, with an estimated started date of January 2019. Application information can be found on our website, with resume submissions due by November 5th. On a more somber note, we would like to recognize the contributions of two community members who helped make NW Seattle a greener place and have left us far too soon. Bruce Hale was one of the forces behind ReTree Ballard’s efforts to plant over 2,000 new trees in Ballard, improvements to the Salmon Bay Park play area and creation of the Salmon Bay School Playfield. Barbara Hainley was one of the volunteers who lead the community efforts to design and build Kirke Park. Both will be missed, but their contributions are lasting.